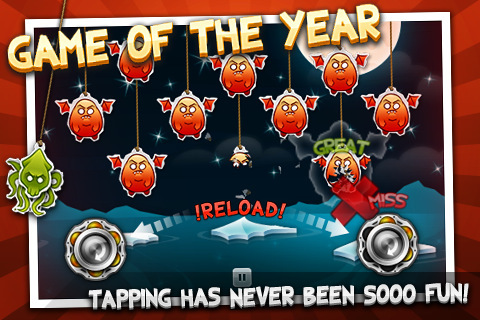 Nawia Games S.C brings us Game of the Year, a tap to play shooter for the iPod touch and the iPhone. The game is very simple to learn but a challenge to master. It has three different game modes: Challenges, Endless, and Horde. There is not much more to the game but the three game modes listed, but for the asking price of $0.99 I can’t complain. When I first played this I immediately compared it to Point Blank for the Nintendo DS. What this game fails to do is add in more than just one type of play style like Point Blank did. I don’t want to play three different “test my accuracy” type games, which is basically what Game of the Year is. It would have been nice to have more unique modes such as, beat the clock, defend the unit, or a 1 bullet in the chamber. Game of the year is as simple as it gets, however, I wouldn’t have minded paying an extra buck or two for some more added mini games. One of the most stressful things about this app was the requirement needed to progress towards the next level. In Challenge mode, unless you get more than half of your shots perfect and a dead center hit, you won’t be able to move on to the next stage. Whenever I first get games for my iPod touch, I try to see if it’s a game I can play quickly. Unfortunately, if you don’t have an overall good score you may have to play the same level a few more times. With negatives there must always be some positives. Fortunately enough, I do see myself still playing this game in the future. It may not be the best shooter app ever made, but it certainly isn’t the worst. With each progressing level, the difficulty does get harder so it’s definitely something worth your effort. Another positive is that this app does use OpenFeint, so you can share your scores with other players online. Again, there isn’t much the game has to offer but for the asking price of $0.99, just be prepared for a one dollar game. Unfortunately, there isn’t a free version for people to try out. So if you are the type that likes to test your pointing abilities on the iPhone/iPod touch, this would be a good game to mess around with. Overall, this app for my iPod touch wasn’t the best game I ever played, but it certainly isn’t the worst floating around the app store. 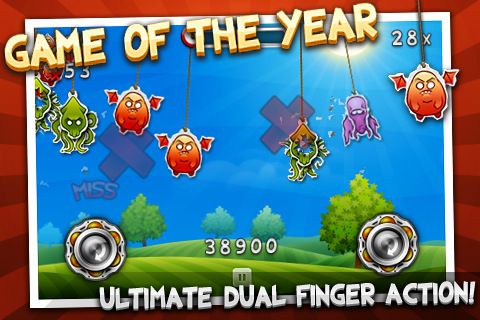 AppSafari review of Game of the Year was written by Vincent Tam on February 8th, 2011 and categorized under Action, App Store, Arcade, Games. Page viewed 5587 times, 1 so far today. Need help on using these apps? Please read the Help Page. After reading the review, I thought I’ll give the game a try. Actually I think it’s even better than they say – very addictive. 4/5 for me. Actually after reading the review I thought that it will be scored higher, and after playing the game I must say that it most certainly deserves a much higher score! The game is really well crafted, the graphics are great and the gameplay is quite addictive. Ideal for short game sessions and with plenty of replayability thanks to the global leaderboards, and challenges where you can ramp up the level ratings.